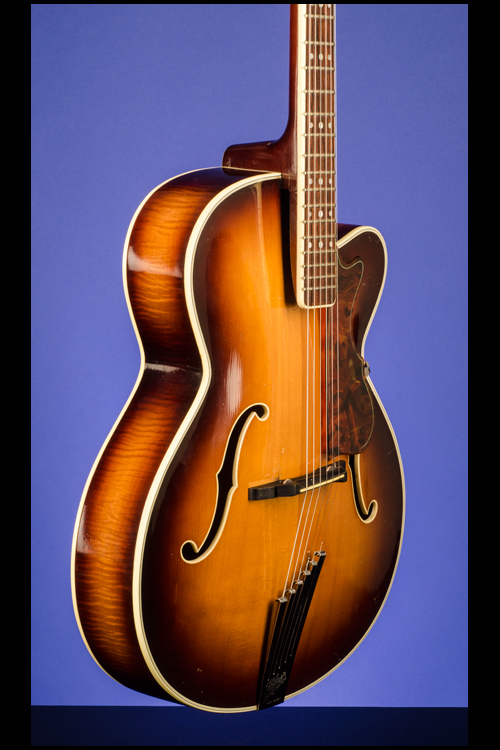 President (Selmer) Guitars | Fretted Americana Inc. 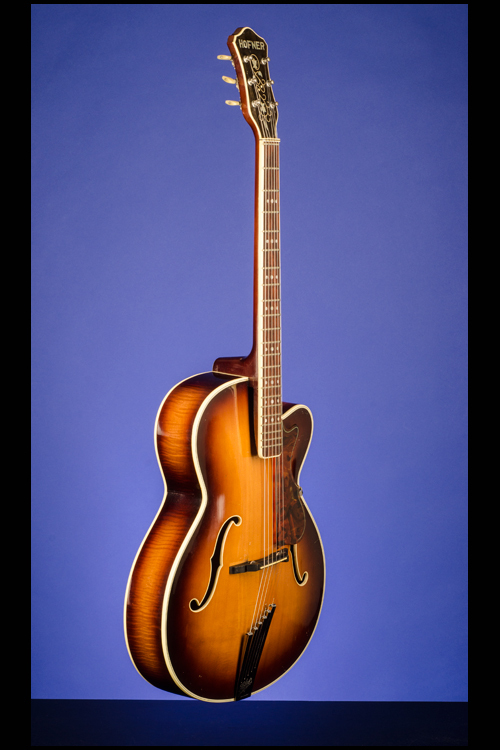 This near mint 16 1/4-inch-wide, just under 3 1/4 inch deep, acoustic archtop guitar weighs just 4.40 lbs. 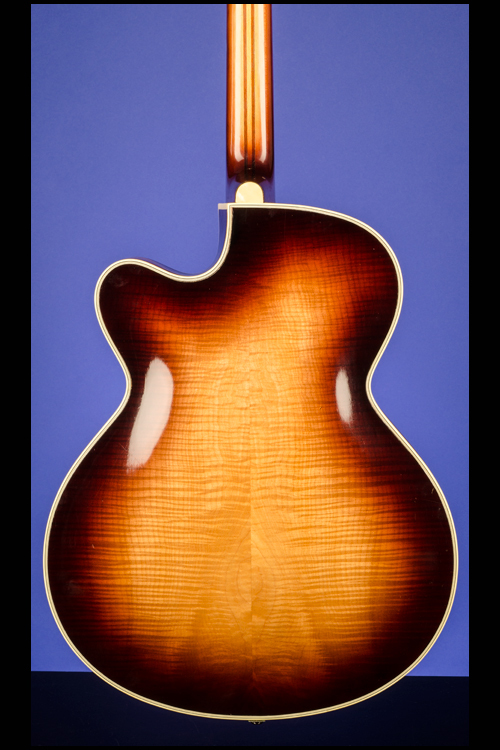 Two-piece book-matched flamed 'fiddle-back' maple back and sides. 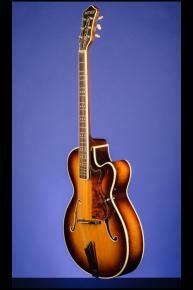 Two-piece carved spruce top with two single-bound 'f' sound holes. The top and the back have six-ply, white over black binding. Single-layer pearloid heel-cap. 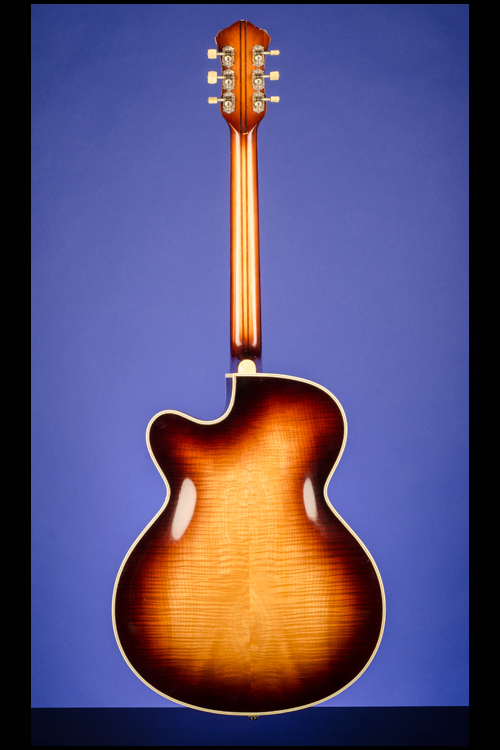 Three-piece maple neck with two mahogany center-strips and a nut width of just under 1 11/16 inches and a huge, very thick profile. Single-bound 'slab' rosewood fretboard with triple-layer nut, 'zero' and 22 original jumbo frets and inlaid 'triple' pearl dot position markers. 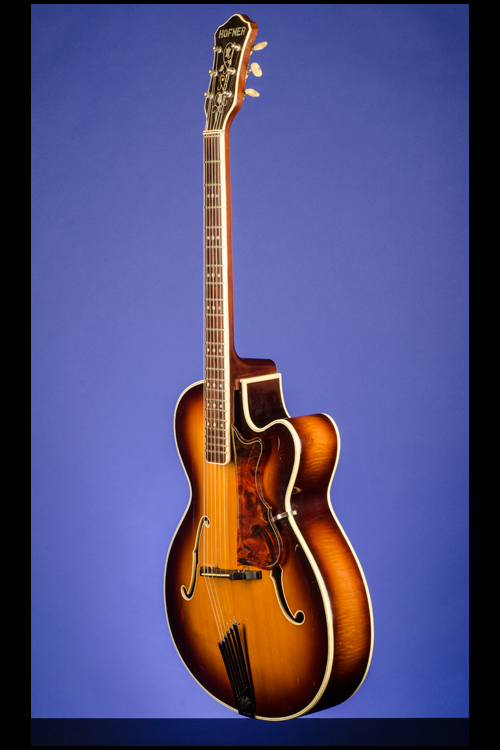 Single-bound, walnut-faced headstock with inlaid mother-of-pearl "Hofner" and vine flower design. 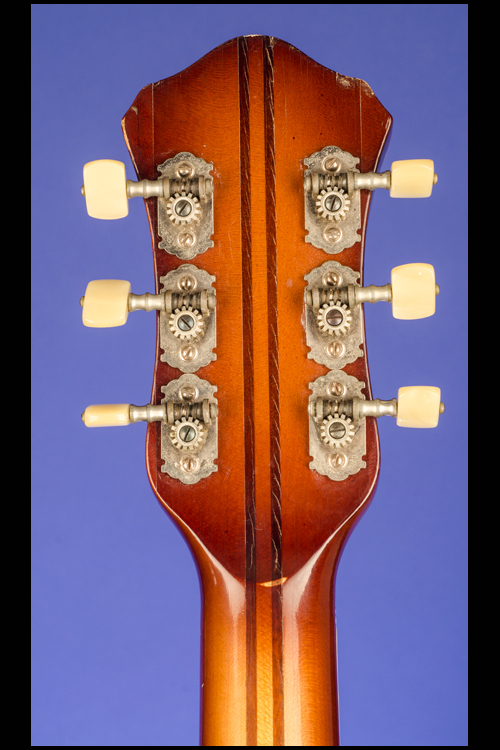 Individual open-back waverley tuners with round edge rectangular pearloid buttons. Specific-shaped, single-layer tortoiseshell pickguard with etched outline. 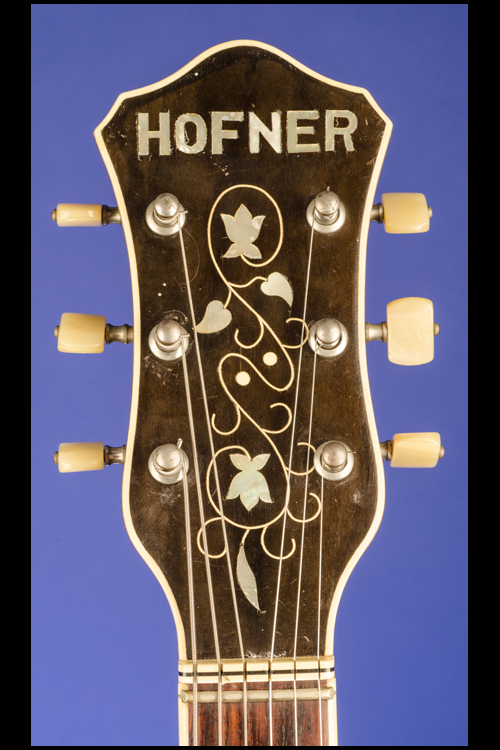 Bone (single) saddle on height-adjustable ebony base and Höfner 'Compensator' tailpiece engraved with "Hofner / Compensator / Regd. 851997" stamped on the lower edge. The underside of the treble 'f' hole has the date "12/3.58" written in pencil. Inside the bass sound-hole is the Höfner rectangular white label with Model "President" and [serial] No. "3877" stamped in black. 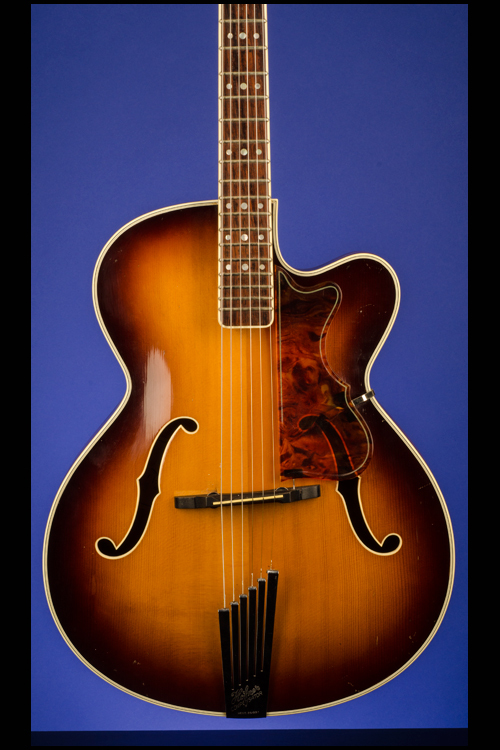 Apart from a few very small and insignificant surface marks, this spectacular guitar is in near mint (9.25) condition. 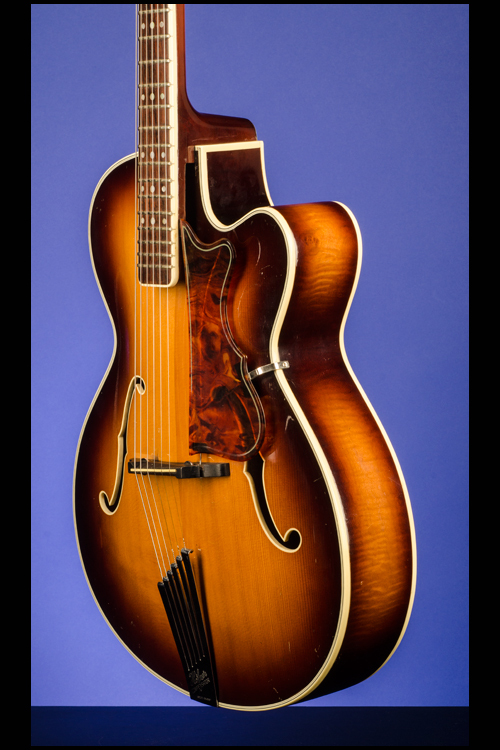 Although the Höfner archtops of this period were built without a truss-rod, this amazing instrument has a very low action and perfect playability - and also a wonderful sound and. 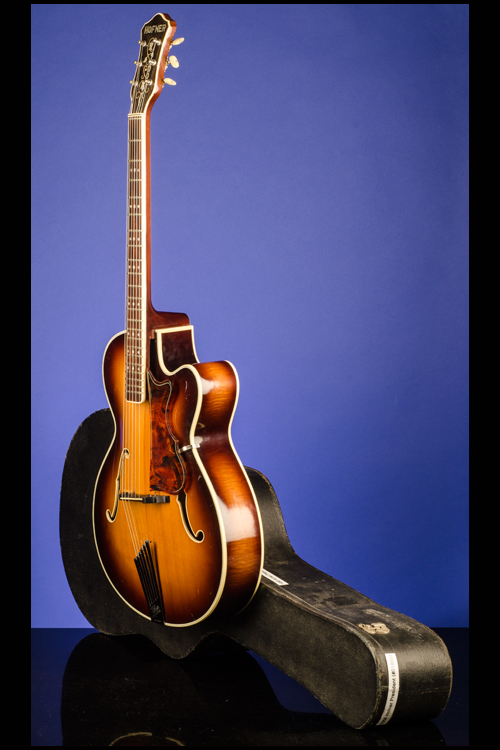 Housed in the original Hofner four-latch, shaped black hardshell case with green felt lining (9.00). 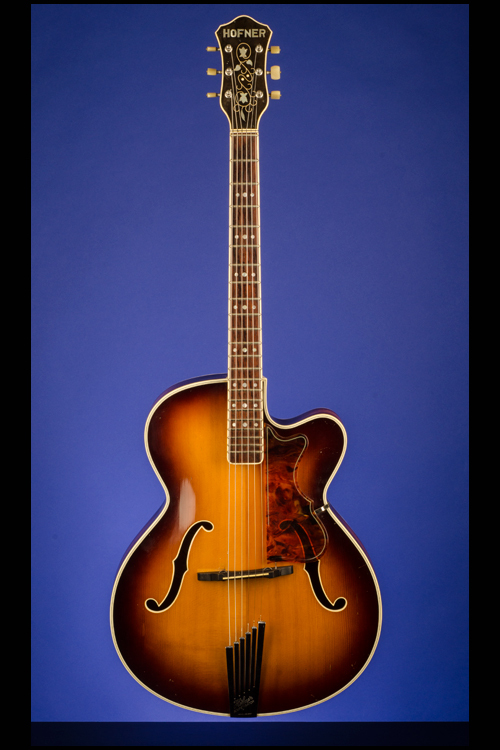 This is very similar to the model as used by George Harrison and Buddy Holly, but is the subsequent variant with the "Hofner" designation on the face of the headstock and no "Höfner" decal on the bass horn.